With the global economic slowdown and need to maintain a balance between fiscal prudence and economic growth, India's Finance Minister, Arun Jaitley, had the daunting task of meeting huge expectations from the Union Budget 2016-17. He has been cautious; however, the announcements through the Budget will bring in several tax reforms to boost exports, encourage start-ups, improve the ease of doing business in India and attract foreign investments. 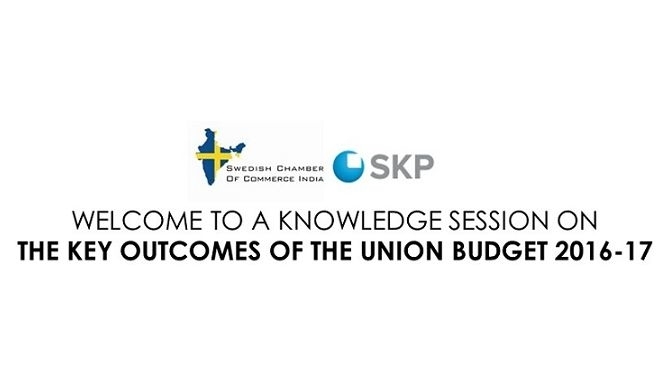 Swedish Chamber of Commerce India’s Knowledge Partner, SKP is organizing a session on the outcomes of the new Union Budget and the implications for companies doing business in India. We cordially invite you to this discussion.